The Gorgeous beauty of Bollywood, Sonam Kapoor has launched all new mobile of Spice S1200, Spice S 1200 mobile comes with an extraordinary feature of 12.2 Mp camera. 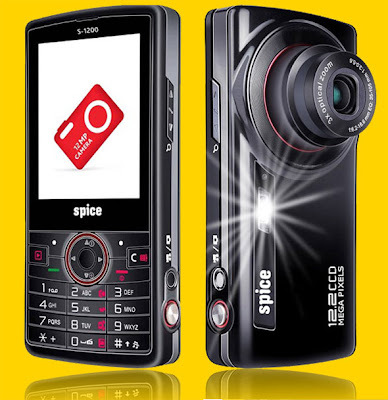 Spice S1200 is a heart throbbing cellphone in the price range of 14500-16000 INR. The all new stylish phone is a hi- tech sensor and hi-performance mobile phone. The feature of this phone are. * Mobile type- Spice S1200 * Screen Type- 2.4 inch TFT screen to cover area of 320 x 240 and 262 K colours * Weight and Dimensions- 130gms with 114 x 52 x 16 mm * Music- Radio Fm. * Camera- 12.2 Mp with professional CCD sensor , 3X optical Zoom and 9X digital Zoom with smile detection, Xenon Flash. * Internet Browsing-In built browser in the configuration of GPRS and EDGE Class 12 and WAP 2.0. * Memory- Inbuilt memory of 750MB with t flash and can be extended to 32 GB. * Battery Life- 1000mAh Battery with a talk time 0f 3 hrs. * Network- It supports GSM networks * Connectivity-Wireless Connectivity in the form of stereo bluetooth * Colour - Black * Spice S 1200 Price- Rs.14500-15999.